Growing up, there was a time I was in a rocker phase. Not quite the Metallica or Twisted Sister type rocker, but like the Jem doll rocker. (Lame, I know.) 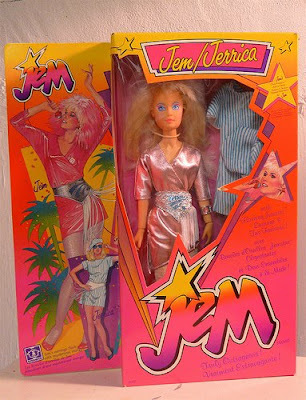 I'd sing along to the cassette tape my Jem doll came with and rock out with a hairbrush in my hand. I think I even recall asking my mom if I could dye my hair pink, just like Jem. I bring Jem up because her little slogan was, "Jem, is truly outrageous!" I was definitely a Jem fan and she was outrageous. You know what else is outrageous? 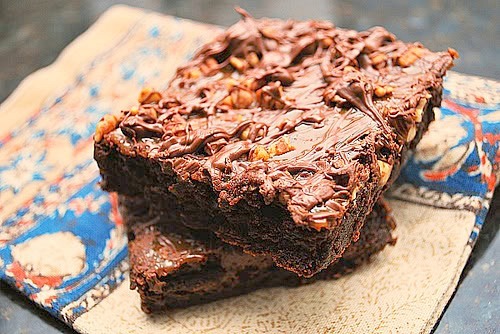 These brownies are. Ina has these 'Outrageous' brownies but I think I can put it over the top. Sure, she has a pound of butter, over 2 pounds of chocolate and half a dozen extra large eggs in her brownie recipe but I can do better. Don't believe me? Well, feast your eyes on my salted carmella brownies. Taking Ina's brownie recipe as a starting point, these bad boys have a bit more salt and are topped with a homemade caramel, Nutella and toasted pecans. I love the way the flavors of sweet and salty play together and these brownies marry them both well. The name, Salted Carmella, just reflects the slightly saltier brownie batter+ caramel + Nutella. Yes, it's a chocoholics dream... and I'm willing to bet even my pink haired Jem would say, "It's truly outrageous!" Melt together the butter, semi sweet chocolate chips, and bittersweet chocolate on top of a double boiler. Cool slightly. In another bowl, combine together the eggs, instant coffee, vanilla and sugar. Stir in the warm chocolate mixture and cool to room temperature. In a small, combine together the flour, baking powder and salt. Add the flour mixture to cooled chocolate mixture a little bit at a time until fully incorporated. Pour into prepared pan. Bake in the preheated oven for about 30 minutes, or until tester just comes out clean. Halfway through the baking, rap the pan against the oven shelf to allow air to escape from between the pan and the brownie dough. Do not over-bake because dry brownies are a bad thing! Wow these look awesome. I am going to have to try them! These look fantastic Joelen. You are truly, truly, truly outrageous! Your brownies do look truly outrageous - yum! Those look amazing! I have fond memories of Jem. I used to watch the show and I can even remember some of the theme song! Wow--You took these to a whole new level! They look amazing! Yummo! You win the title for most outrageous brownies! Yours look so decadent and delicious. I love the sweet and salty combo. Thanks for bringing back the memories of the long forgotten Jem! This is different. Can't wait to try it!